Manchester United recorded an impressive and entertaining 2-0 win over Southampton on Friday, with Zlatan Ibrahimovic scoring twice and Paul Pogba impressing! With Crystal Ball securing a corporate membership at Manchester United's Executive Club for the 16/17 season, this provided a unique spectator experience for our highly valued customers at the much anticipated first home game of the season. 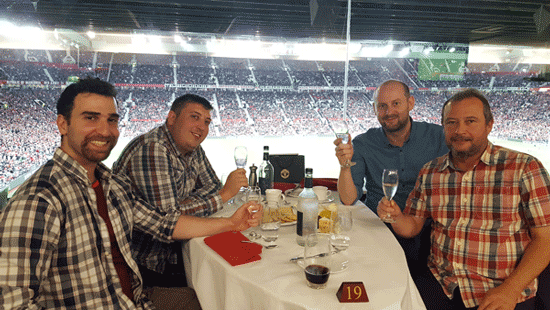 With champagne and canapes on arrival followed by a 4 course a la carte menu and unlimited beverages, Crystal Ball's Senior Account Manager; Tony Buckley and Application Developer; Jose Bento were chosen to watch the game along with customers Ian Seddon from JS Fleet Services Ltd and Danny Boulton from Contract Lifting Solutions Ltd.
All 4 enjoyed the game from within Old Trafford's famous Stretford Suite overlooking the pitch. A fantastic evening was had by all with great food and company, drinks flowing and a win for Manchester Utd! We look forward to inviting and treating more customers at Man Utd with the next home game being the Manchester Derby, September 10th.